HARITAKI, though its taste is very astringent and unpleasant, is one of –if not the most – important Ayurvedic herb. It is a rejuvenative for Vata, regulating Kapha and only aggravating Pitta in excess. It feeds the brain and the nerves and imparts the energy of Shiva (pure awareness). Haritaki is the basis for triphala, the three fruits (haritaki, amalaki and bibhitaki), and is one of the main Ayurvedic herb. It is a rejuvenative for Vata, regulating Kapha and only aggravating Pitta in excess. It feeds the brain and the nerves and imparts the energy of Shiva (pure awareness). It improves digestion and absorption, promotes voice and vision, and aids in longevity. Haritaki increases wisdom and intelligence. It reduces accumulated and congested Vata. It scrapes ama away from the tissues, especially from the digestive tract, and rejuvenates the body, especially the colon and lungs. Haritaki is an effective astringent and gargle for ulcerated surfaces and membranes. It regulates the colon and, according to dosage, corrects either constipation or diarrhea. It improves digestion and absorption, promotes voice and vision, and aids in longevity. Haritaki increases wisdom and intelligence. It raises prolepses of the organs and checks excessive discharges, including cough, sweating, spermatorrhoea, menorrhagia, and leucorrhea. It reduces accumulated and congested Vata. 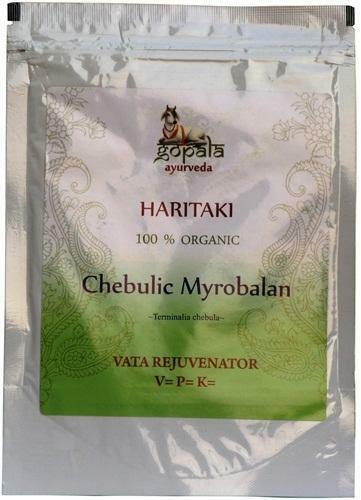 Haritaki is the basis for triphala, the three fruits (haritaki, amalaki and bibhitaki), and is one of the main Ayurvedic compounds. Triphala is the best laxative and bowel tonic; a balanced rasayana, and an effective astringent for external use. Haritaki is rejuvenative for Vata; amalaki for Pitta; bibhitaki for Kapha. The conditions indicated under these three herbs can be treated by this compound. In the cornucopia of ayurvedic herbs there are only a few which have the quality of being tri-doshic, such herbs are much celebrated in India for their ability to bring balance all three doshas, and so restore health to anybody regardless of their particular constitution. Of these herbs, perhaps the most important is Haritaki, a powerful and well-rounded herb with a vast range of applications in ayurvedic medicine. The meaning of the name Haritaki is a small reflection of its power and versatility. It is named after its patron, Lord Shiva or Hara, as it both comes from the realm of Shiva, the Himalayas, and imparts the fearlessness and the clear perception for which Shiva is known. This name also refers to the universal action of the fruit by indicating that it carries away (harate) all diseases, and also to the yellow dye, harita, which is derived from it. According to ancient legend, haritaki came from a drop of Indra’s cup which grew into a tree when spilt upon the ground. The power and range of application which Haritaki bears are derived from its dynamic energetics. Haritaki combines five of the six tastes, excluding only saltiness, however, it is primarily astringent in taste. It is further heating in energy and has a sweet post-digestive effect, or vipraka. This combination renders it a very effective alleviator of vata imbalance and the eliminator of ama, or accumulated toxins. After the dryness of its astringent taste has broken down ama and accumulated vata, its heating energy and moistening effect then work to counteract the cold and dry nature of vitiated vata and move the toxins from the body. While it is a strong rejuvenative for vata, it also regulates kapha, and only aggravates pitta in excess. Further, it feeds the brain and the nerves and imparts the energy of Shiva, pure awareness. The astringent qualities of Haritaki render it a potent cleansing agent for the body inside and out. It works to clean all tissues, including the arteries and particularly the passages of the gastro-intestinal tract. It has been shown to reduce cholesterol in the liver and arteries, specifically the aorta. In recent studies an alcohol infusion dramatically helped the healing of wounds when applied topically. It is also good as a gargle for ulcerated and infected gums, as it has strong anti-bacterial, anti-fungal, and anti-viral properties. It has even been effective in the slowing and stopping, and in proper doses, the killing of cancerous tissues. Haritaki, however, is most known for its cleansing effect on the digestive system. It regulates the colon, and depending upon dose it can treat either diarrhea or constipation. It is the base of the famous herbal blend Triphala, which is a mild laxative that thoroughly cleanses the digestive system of ama. Haritaki is recommended to be used in all sorts of gastro-intestinal dysfunction from dyspepsia, vomiting, and malabsorbtion to hepatic or spleen diseases, and parasitic infections. The wide applicability of Haritaki is directed through its manner of use and the form in which it is taken. When taken as a powder, Haritaki is an efficacious purgative, but when the whole dried fruit is boiled the resulting decoction is useful in the treatment of diarrhea and dysentery. The fresh or reconstituted fruit fried in ghee and taken before meals enhances digestion. If this latter preparation is taken with meals it increases clarity of mind, voice, and vision, and the remaining senses as well as the five actions of the body, it is also purifying for the digestive and genitourinary tract. Taken after meals, Haritaki quickly cures diseases caused by the aggravation of vata, pitta and kapha which have resulted from unwholesome food and drinks. Contents: 250g organic Haritaki powder packed in Light Proof Highest Quality Food Grade Zip Lock Pouch. Convenient and easy to carry around.